I’ll combine a duck post with a food post today. Since “d” comes before “f”, here’s the Daily Duck Report. Frank hasn’t been seen in two days, and I wonder if he’s gone for keeps. 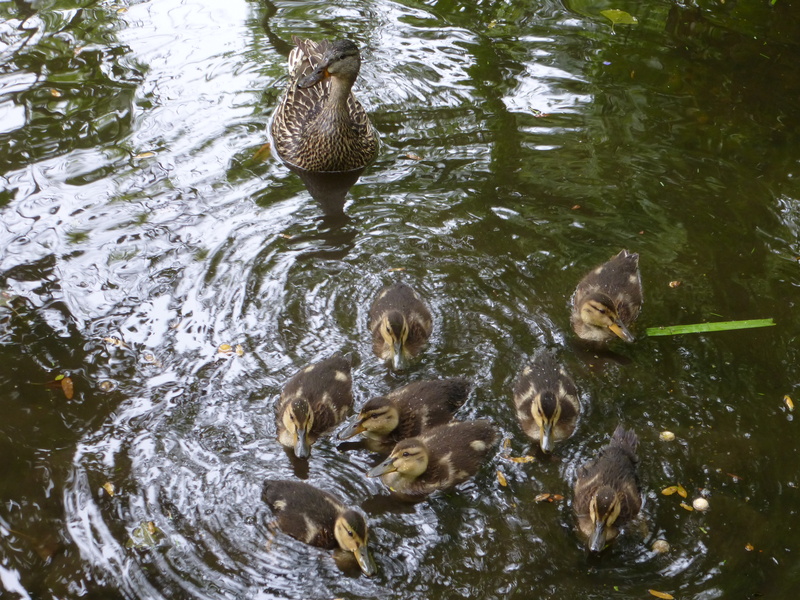 Though he’s likely the father of these ducklings, and used to eat from my hand, I have mixed feelings, since he chased and disturbed the ducklings during feeding time. 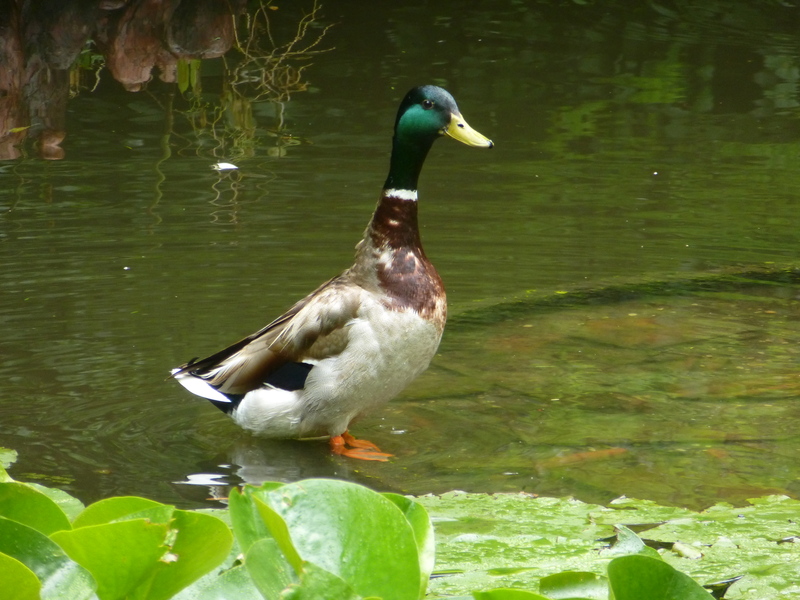 Henry’s still around, though, and is still being chased around (and out of) the pond by Honey. I give him food on the grass. 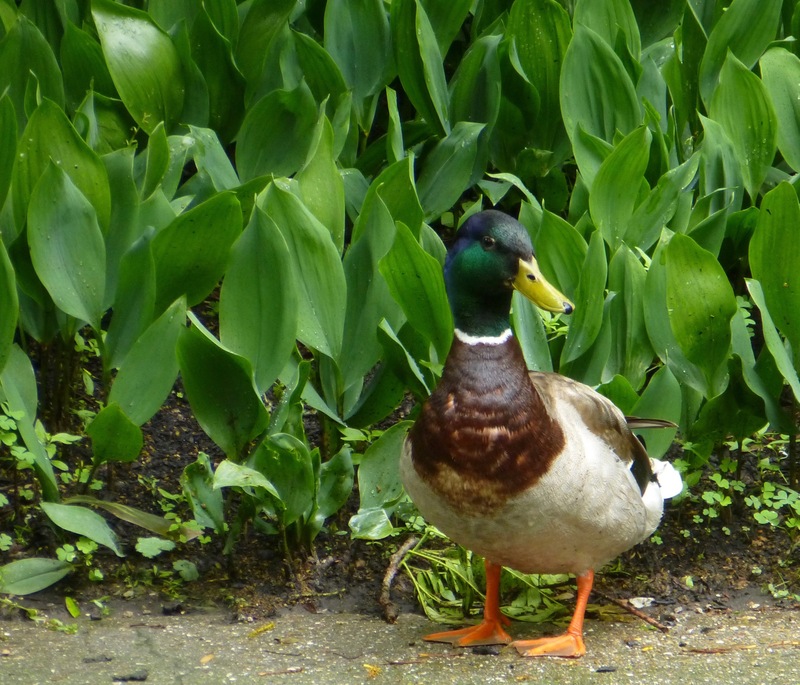 Poor beleaguered mallard! Here are two views of the lad. Next, food. Yesterday I met my friend Simon, who does research on prostate cancer up in Evanston, for one of our occasional meals in local restaurants. 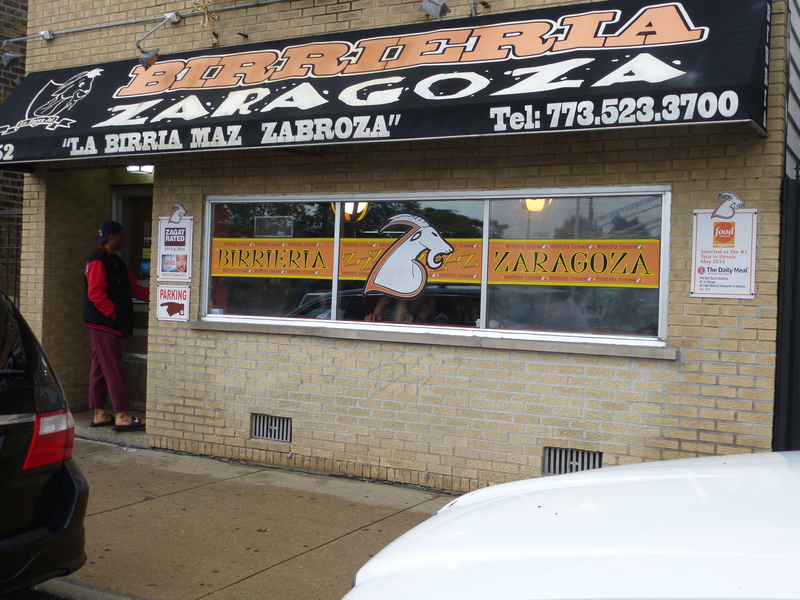 This one was my choice, the Birrieria Zaragoza, near Midway Airport. 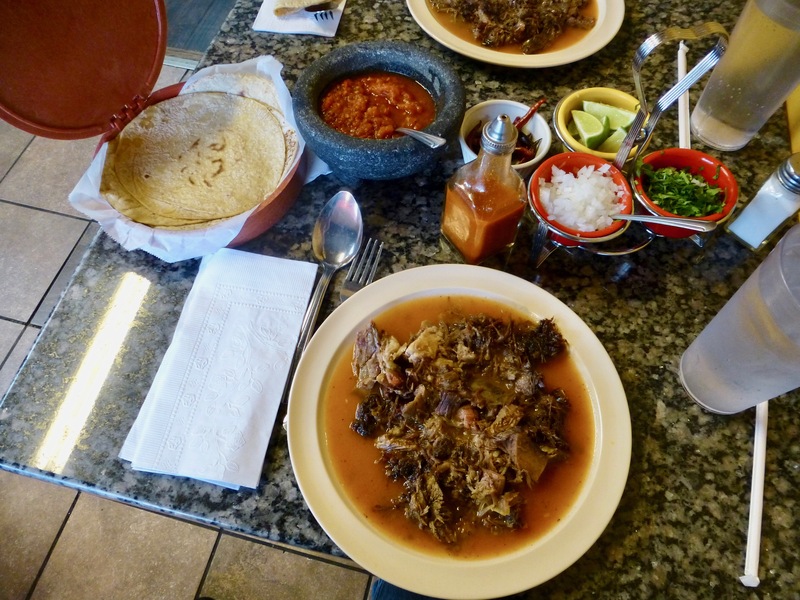 It specializes in marinated and stewed goat; in fact, that’s all there is on the menu except for quesadillas. You can have a big or small plate of goat, with bone in or bone out. The juices that come on the plate make a terrific soup, and of course must be spooned up and slurped. A well constructed taco. You can see how thick those tortillas are. We went through six each, and could have had more had we not finished the goat. It was fabulous! Driving home, I decided I wanted a paleta for dessert; these are handmade Mexican fruit ices, and at this nearby place came in about 25 flavors. I opted for strawberry but now regret I didn’t get mango or even rice pudding. (I should also have photographed the big case full of them.) A paleta is a light and refreshing dessert after a heavy meal of goat. This paleteria specializes not only in paletas, but Mexican ice cream in tropical fruit flavors, and various yogurt concoctions also made with tropical fruit. They also have regular food. My paleta fresa, which soon vanished into my gob. The fruit and water are mixed with milk, so these are called paletas de leche. This entry was written by whyevolutionistrue and posted on June 11, 2018 at 2:30 pm and filed under ducklings, ducks, food, food and drink. Bookmark the permalink. Follow any comments here with the RSS feed for this post. Both comments and trackbacks are currently closed. We have those milky fruity Mexican popsicles at our local 7-11. They are really good. Thanks for the reminder. Henry is a cool dude but I have a feeling that underneath the facade he is just another Frank like they all are. I think poor Henry is traumatized from last year’s attempt to hang out in a pond at Northeastern. He’d heard about all the quack science in the Dept of Women’s Studies, and misunderstood…. Looks like great food. Has been many years since I was in Chicago and only for short times. Seems like Midway was in Cicero, maybe some of it a rough part of town. Sort of. Midway is on Cicero ave in the Westlawn, Clearing, Garfield Ridge neighborhoods. 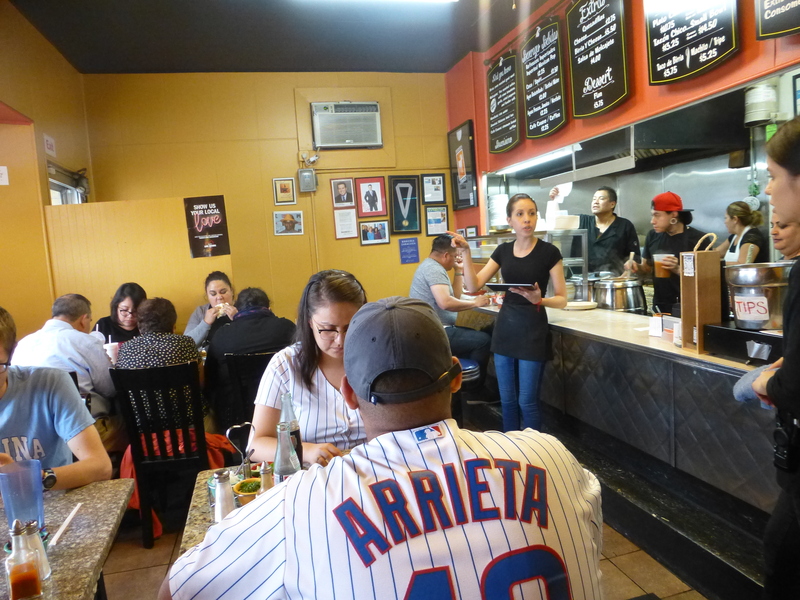 It’s a few miles south of the town of Cicero, which is also on Cicero Ave.
Everything looks so delicious, oh my!! I would love some stewed goat right now. Unfortunately I’m flying out from the other airport Sunday or else I’d stop and try some. It looks delicious. How’s the tripe, if you’ve tried it? I loves me some tripe, though I don’t get it that often. Got my buddy the chef to fix it the last time I visited; stinks up the kitchen somethin’ fierce, and his wife and kids complained, but it tasted mighty fine. Goat is good! My daughter does a wonderful haunch of goat on special occasions. She raises the goats herself. This may be a stupid question, but I’ve always been curious: is cuteness considered a survival asset in animals and, if so, is it geared explicitly to humans? I.e., I can’t imagine any other potential predators being deterred by the cuteness factor? Does Honey thinks her brood is cute? They are surviving because they live in man made conditions with a special man who cares for them. I could be wrong. Humans are supposedly selected to find the big heads and eyes, and disproportionate features, of human babies, cute. Those individuals who found the appearance of their babies repugnant would be less likely to care for them and would leave fewer genes. Over time, that would favor genes that made us think human babies are cute. (Those disproportionate features are also seen in kittens, ducks, etc., and others have speculated that this is why humans find baby animals of many sorts cute). I suspect the same goes for ducks, cats, etc. Selection has made them find the appearance of their offspring, which itself is conditioned by the constraints of development, appealing, and those sentiments invoke protectiveness and parental care. Whether that means Honey thinks her ducklings are “cute”, well, we don’t know: we don’t have the mind of a duck. But I’m sure she finds those babylike features something that stimulates her maternal behavior. Thanks much for the good answer and for taking the time to reply. I’ll check out the Gould. The fruit ice place. The area of Mexico that the place is how I learned how to cook Mexican food. Handmade tortillas, everything. Mouthwatering. Fantastic pics of tacos. Thanks for sharing. Oh man, I love some good tacos and that looks like a fabulous taco meal. 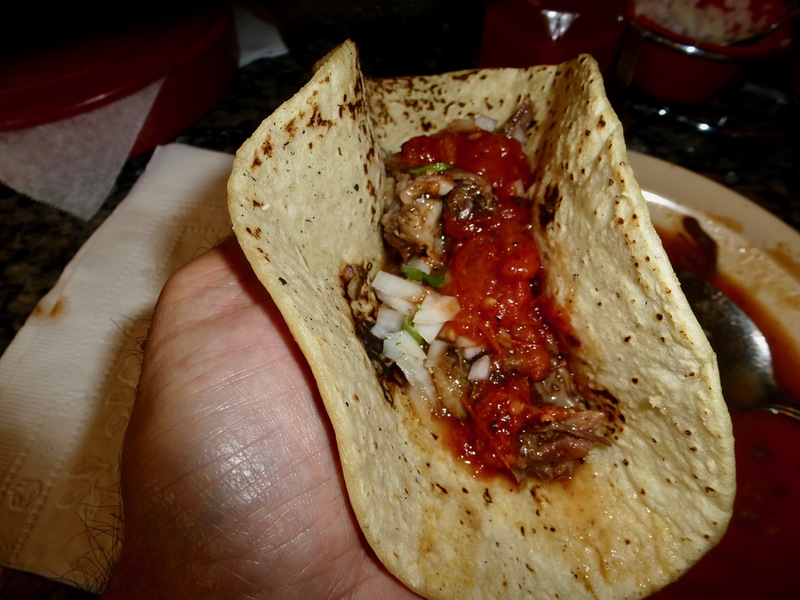 Good, fresh tortillas are so much better than the typical store bought it really takes a taco to the next level. The only times I’ve had goat is at Caribbean restaurants, usually Jamaican, at which I get the curried goat any time it is recommended. 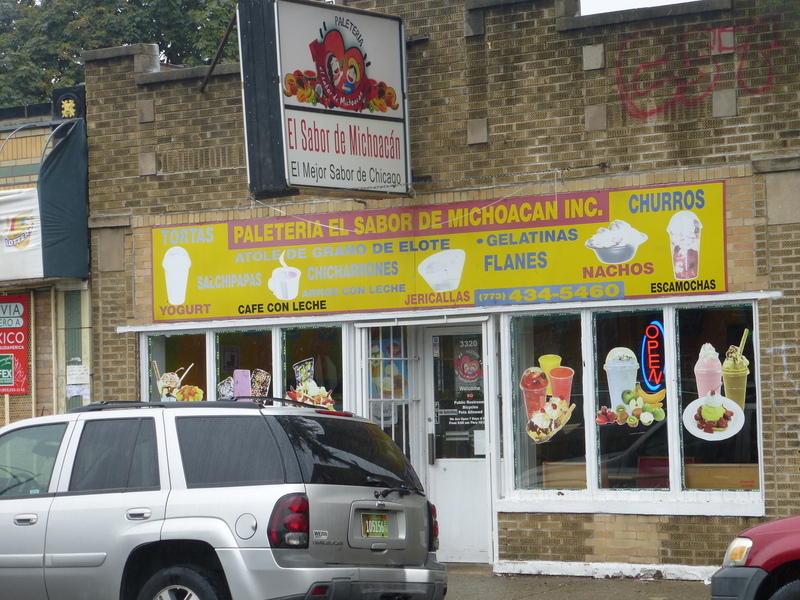 Does your paleteria offer chamoyadas? I usually prefer my raspas (lime! mango!) to be unadulterated, but chamoy provides an interesting flavor that’s worth trying. Tajin seasoning is also available at paleterias/raspas stands here (like all good South Texans, I keep a huge bottle in my kitchen and sprinkle it on all kinds of things: eggs, avocados, popcorn, corn on the cob, etc.). Thanks for the tip! Just ordered some. Here if one wanted goat stew one would likely go to one of the slightly more upscale Arab places, or in Montreal one could go to some of the “petite Magrheb” stuff too.